Collect information from your users by embedding Wufoo forms and surveys directly into your Confluence pages. Being able to embed Wufoo forms directly into Confluence pages means that you'll be able to capture information from your users or your customers. Any form or survey that can build in Wufoo can be easily embedded into Confluence page using their Widget Connector feature. Now you have the best of both worlds! Your Confluence site keeps your team together and Wufoo allows you to collect any information you might need. 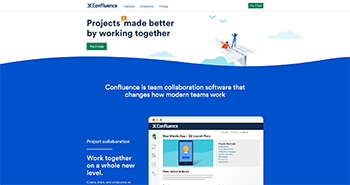 Confluence is intranet software that keeps teams on the same page. An "Enterprise Wiki" if you will. It is powerful online authoring software that helps you and your team stay organized and work better together by effortlessly sharing information.